In the 21st century humanity entered into the era of modernization, the era of green and eco-friendly energy potentially capable to replace old-fashioned nuclear powerplants constantly polluting the environment: rivers, and lakes frequently used as natural coolers for pressurized water reactors. The point of no return was achieved with the invention of the windmill power station technology and solar panels, which now overgrown into the supermassive wind & solar powerplants spread around the world. It is exactly electric linear actuators that make this eco-friendly technology a few times more efficient. The great benefit of wind & solar energy resources cannot be overestimated. At the time when global warming is knocking at our doors using natural energy resources is not a matter of choice it is a matter of cautiousness and smart approach. Making the technology of transformation wind power and solar power into pure energy greatest minds of Earth were trying to get the biggest benefit possible out of what they had. And they succeeded – designed the solar tracker system based on the special type of electric linear actuators which have multiple mounting options. Thanks to their specifications it is possible to make the most efficient and productive synthesis of energy. Possibility to change the position of expensive solar panels along the direction of the strong wind in case of heavy storms to prevent them from serious damage and back when the weather backs to normal. 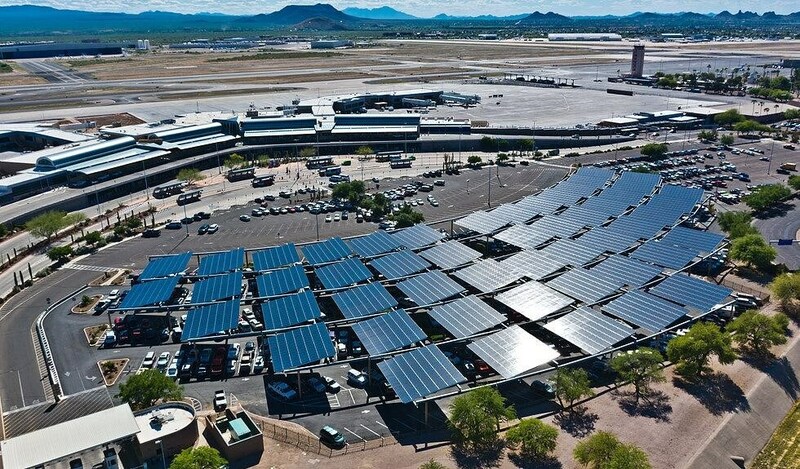 Tucson International Airport – the powerplant also known as the “Solar Amphitheater” produces 1.25 MW. Honolulu International and Kahului Airports – solar power plant producing 2.474 MW installed in the hurricane-prone location. Improved with the non-corrosive mounting systems made of plastic materials. Minneapolis-St. Paul International Airport – solar power plant producing 3MW of the energy was installed there in 2015. Considered to be the largest powerplant constructed in Minnesota. Chattanooga Airport’s powerplant – the eco-friendly source of energy providing the airport with 85 percent of the energy needed which is 2.1 MW. Tampa International Airport – solar powerplant of 2 MW energy capacity. The technology of solar trackers helped to improve and complement the solar power panels system. This symbiosis of high technological devices and engineering technologies created the perfect system capable of producing extensive amounts of eco-friendly green energy. This is the technology potentially capable to prevent global warming and glaciers melting for good.